Audiences expect to hear patterns in popular songs, so they can understand and interact with the song. As a songwriter, if you are aware of your audience’s expectations you can use these expectations to hook you listeners and take them on a journey… ignore these fundamental patterns or their expectations and your audience will tune you out. Have you ever listened to a song and heard what was coming next? It might have been the next rhyming word or known that the chorus was coming in a few bars? Everyone does this… as you listen to music you try to figure out what’s happening and what will happen next. When music is too predictable it becomes boring… for most people it’s no fun to know what’s coming next every time. You also need an element of surprise. When you can’t predict what will happen next, that is if there’s too much surprise, people tune out and get turned off. Music turns into noise. As a songwriting you want to be predictable, but not too predictable. You need a balance between predictability and surprise. You create predictability by using patterns. Surprise is how you change or break the patterns you use. I think about this in several ways… the ebb and flow of musical energy is tension and release. Patterns can be stable or unstable, they can be closed or open. First tension and release. Tension is felt as you build musical energy towards a goal where it’s released. For example, there is tension and release in lyrics… where you start to predict where the story is headed, the tension is released as you find out what happened. As you listen to a lyric, the rests at the end of a line or section provides a release as you have a moment to process what you’ve heard and create internal images from the lyrics. Melodies have tension and release, as they rise and fall and also as they fit into or clash with the underlying chord progression. We’ll come back to this in the Memorable Melody Module. There is also tension in a chord progression as it moves towards the release of the tonic chord… we’ll get deep into that in Writing Killer Chord Progression module. For now, observe and become aware of changes in tension as you listen to your reference tracks. I also think about patterns as Stable or Unstable. Stable or closed patterns sound finished and can stand on their own. Unstable patterns are open, they sound unfinished. You are left expecting something else, expecting them to be completed. Some examples of stable and unstable patterns include lyric rhythms, lyric rhymes or chord progressions. For example, several lines of lyric rhythms that are extremely similar, sound stable, but if the rhythms are different it feels unstable or uncertain. Perfect rhymes feel stable, and near rhymes are unstable. You can subconsciously convey tension or uncertainty to your audience by intentionally using unstable lyric rhythms or open rhymes in your lyrics. More on this later in this module. Chord progressions can also create a stable or unstable effect. When you get to the end of a song section you can choose a stable cadence to give a solid ending. If you want to create uncertainty to match your lyrics, or push into the next section, like a pre-chorus into the chorus, you can leave your listener hanging with an unstable or open ending to the chord progression. As you are writing, consider how you can use patterns and audience expectations to tell the story, to emphasize important points in the lyrics and how you can engage your audience. It gets really interesting when you deliberately use contrasting or contradictory patterns. A simple example would be a happy lyric set in a minor key, like I did with Need Your Love. A more sophisticated example might be a supposedly happy love song with verses about how things are great. Using unstable lyric rhythms, unstable rhyme pairs and open sounding chord cadences you can subliminally create tension that is released when the chorus tells the audience that this happy love is actually doomed for failure. 4. Open and Closed patterns. Deliberately controlling the interplay of these factors can lift your song to the next level. In the next video, we’ll examine how you create deeper meaning in your lyrics. What are your favourite patterns that you use in your songwriting? 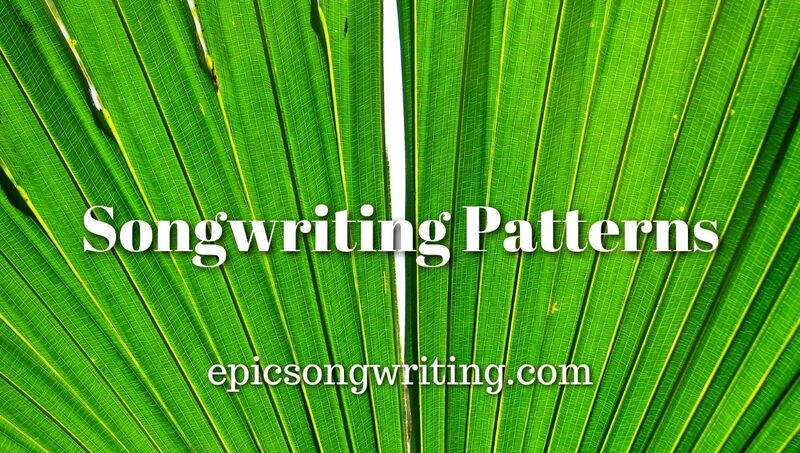 0 responses on "Songwriting Patterns"